Rummaging through some old Disneyland memorabilia, I came across this July/August 1967 issue of Disneyland Hotel Check-In. Needless to say, it conjured up all sorts of memories of summer vacations spent with my family at Disneyland. 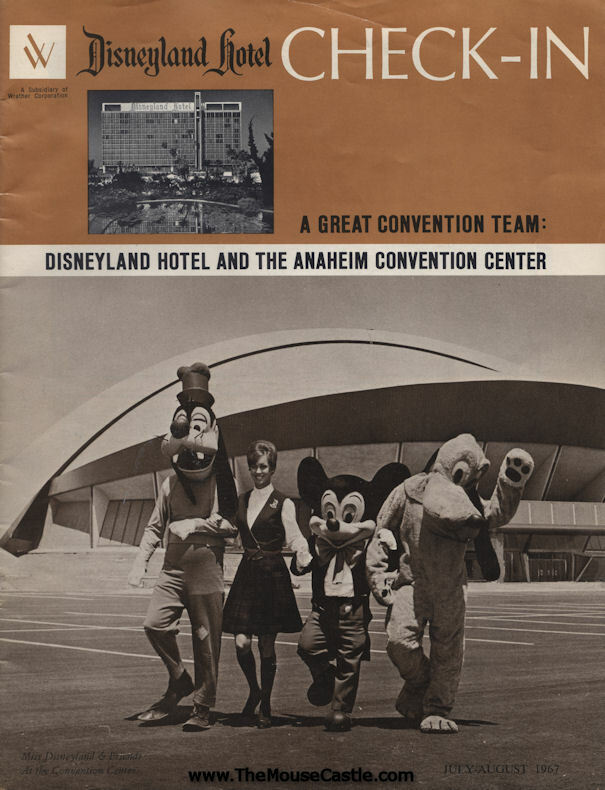 Check-In was a free magazine given to hotel guests that spotlighted events and attractions in the Anaheim area. This particular issue celebrated the grand opening of the Anaheim Convention Center. On the cover were Goofy, Mickey, Pluto and "Miss Disneyland" Marcia Miner, Disneyland's 1967 ambassador. The Anaheim Convention Center opened on July 12 with a gala performance by the Orange County Symphony Orchestra under the direction of special guest conductor Arthur Fiedler. Three days later, '60s rock icon Jefferson Airplane shared the stage with Jim Morrison and The Doors. The inaugural meeting event at the Convention Center was the Home and Decorators Show. In this aerial photo from the magazine, you can see the nearly completed Convention Center (bottom left) with its 9,100 seat dome-shaped arena. Top left is the Disneyland Hotel with its single Tower Building. Look carefully behind the tower and you can see the 9-hole executive golf course (sized down from 18 holes) that was once part of the resort. On the right is Disneyland and its massive parking lot. Compare the photo to this modern day shot from Google Earth. The area's filled in a bit over the last 44 years, and not just with Disney California Adventure. 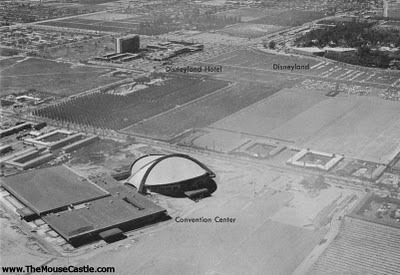 When the Anaheim Convention Center opened, it had 375,000 square feet of meeting and exhibit space. After three major renovations, today the exhibit hall space alone exceeds 800,000 square feet. Since 1967, the Disneyland Hotel has added two more towers, which have recently undergone major remodels themed to Adventureland, Frontierland and Fantasyland (the Fantasy Tower will be completed in 2012). The original front of the Disneyland Hotel was torn out in the late 1990s to make way for Downtown Disney. Here's a question for Disneyland Hotel veterans: Remember when you always took the Monorail or the tram to get from the hotel to Disneyland because walking was just way too far? Now it seems like nothing to stroll the length of Downtown Disney. I guess that's what happens when you have something other than pavement to look at. Of course, the absence of a hotel tram kind of limits your options. Disneyland Hotel Check-In also featured an article on the new Tomorrowland, the $23 million makeover of the land of the future that introduced the classic PeopleMover, Carousel of Progress and Adventure Thru Inner Space attractions. while the Rocket Jets soar overhead. 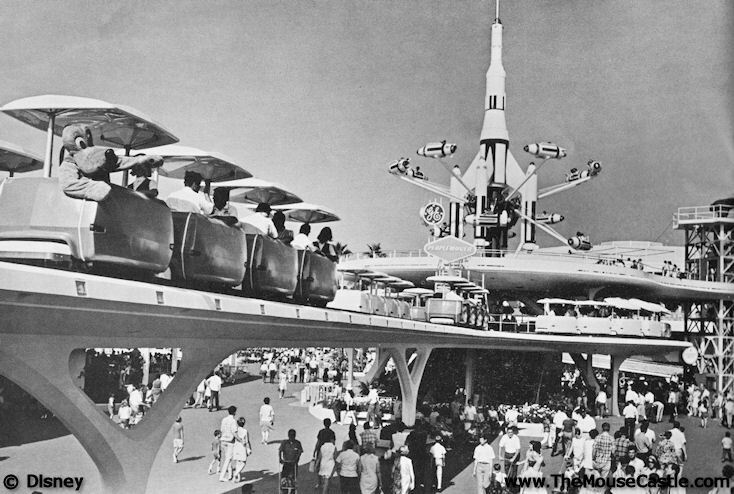 Check-In called Tomorrowland "a world on the move--entertaining space-age exploration and scientific adventures aboard a whole network of totally new transportation systems." the 1964 New York World's Fair. This Tomorrowland of my childhood was bright, wondrous and constantly on the move. Today's Tomorrowland of Space Mountain, Star Tours and Buzz Lightyear's Astro Blasters, though entertaining, just doesn't have the same energetic feel. Maybe it's just childhood bias. As we get older, the good times of our youth always seem that much better. 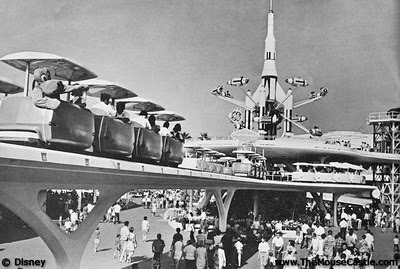 Or maybe Tomorrowland 1967 really was better. My dad shot this 8mm home movie of Disneyland that year. The Tomorrowland footage, complete with the Skyway, PeopleMover, Submarine Lagoon and Autopia, starts at 4:03. Yep, 1967 was a very good year.